22nd July, 2018 | What has your Nest Protect been Gossiping about Lately? What has your Nest Protect been Gossiping about Lately? Earlier this year, Google reported having sold over 11 million Nest devices to date. Perhaps one of the most essential, trusted, and well engineered of these devices is the Nest Protect Smoke + CO Alarm. The conveniences of this device, which include intelligent notifications of smoke and carbon monoxide alarms (from home and away), remote management, automatically lighting the way in the dark, combined with the overall reliability of this device make it a solid choice for a consumer looking to upgrade their legacy smoke/CO alarm. Amongst all of the Nest devices, this one is in the top category for having the most sensors and transceivers. Given the essential need for smoke/CO alarms, combined with the Nest Protect's capabilities of 24x7 collection of activity in your household, we decided to further investigate this device to better articulate what it gives to your home vs. what it takes. Speaking of take, it's also important to know that once you have chosen to disclose household telemetry to Google, it will be stored in a centralized location, correlated and linked to other information that you have provided to Google, including from your smartphone, and can potentially be accessed by other parties without your knowledge. The combined value of the linking of this information is high and reveals a lot more about your lifestyle than you might assume. 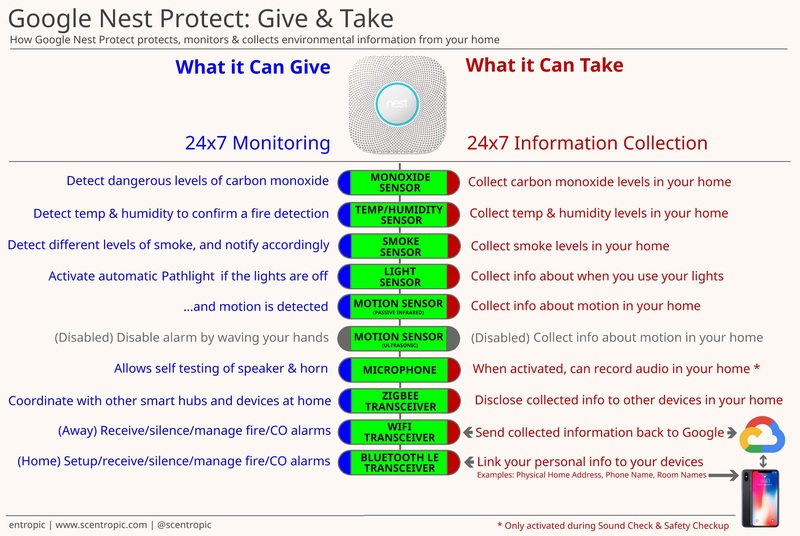 Below is an illustration that shows the advantages of having a Google Nest Protect protect your home, along with the information that it can gather using a myriad of sensors and transceivers. Can it be Told to Collect More, or Different Data Over Time? Yes, it is possible for Google to roll out updates to the Nest Protect that can change the ways it uses it's sensors - for example how long these sensors stay on based on certain events, or what they do at certain times of the day. These updates can happen at any time, and don't need your confirmation. The Google Privacy Statement articulates how they currently collect information, and how it is used. This privacy statement can change at Google's discression, and has historically been updated at intervals ranging from 1 month to 1 year. Go to MyNestData and if not already, sign in. Once you are signed in, select the "Request My Data" button near the bottom right of the screen. Select the specific Nest data that you would like - ex: "All your Nest Data" by selecting the slider on the right side. Select the "Create Archive" option and wait for the data to become available - which should be almost immediate. You will get an e-mail once it is ready. Select the "All Requests" button to view the created archive of information collected from your Nest devices. 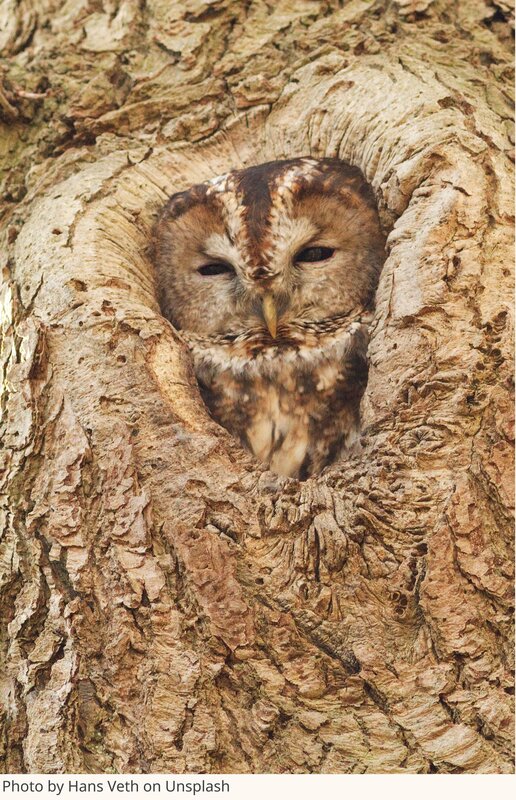 Select the archive to download the file ("NEST_DATA_....zip"). Once you open the archive, you will see a series of folders that represent the information that is collected. To view Nest Protect specific information, go to the "/Nest/protects/" folder. Under this folder, you will see unique numbers representing each Nest device that you own. Select any of these device folders to view a series of year/month folders that contain the historical information collected from this Nest Protect device over time. While the focus of this article has been on your privacy at home, the ramifications of installing Google Nest devices in the workplace are far broader. There are already emerging blockchain-based technologies, such as Luxcore which will help provide the same high-grade security and privacy to consumers, corporations, and governments across the board. These technologies could be used in the future to protect against the loss of sensitive environmental information from people, companies and governments who want the advantages that these intelligent devices bring, minus the security and privacy risks. Luxcore is described in more detail in this article originally posted on MintDice.com. Nest Protect Teardown (SparkFun Electronics).